A war of words has broken out between Brisbane City Council (BCC) and the Queensland Government over funding for bus services. In Parliament State Transport Minister Rachel Nolan accused Lord Mayor Campbell Newman’s administration of "leaving commuters stranded" through its decision to cut transport spending in this week’s budget. Council admits transport spending will be cut by $26 million to $205 million in 2010-11. But council’s transport chairperson Jane Prentice says services won’t be affected, with operational funding for transport set to rise to $102 million, up from $91.7 million last year. Funding for bus services will increase to $68 million in 2010-11, compared with $65.5 million previously, including $56 million for the acquisition of 125 new buses. "We’ve actually increased the public transport operational budget to cater for our planned 125 equivalent additional buses and two CityCat ferries to be delivered this coming financial year," she says. Capital expenditure will decline in the coming financial year due to "prudent financial management", according to Prentice. "The capital budget has decreased because Brisbane City Council has engaged the private sector to deliver new bus depots to save ratepayers money," she claims. "We are delivering the same projects that we promised to deliver, but we are delivering them in a cost-effective way." However, Nolan contends the council hasn’t lived up to the terms of its partnership with TransLink. "When TransLink was established in 2004, Brisbane buses were a 50-50 partnership between the state and the council," she says, claiming that BCC’s contribution has fallen to 38 percent. 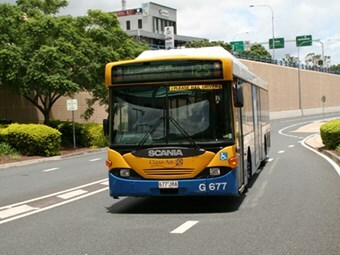 Figures supplied to ABC by TransLink indicate the State Government’s funding support for buses is increasing. In a statement released by CEO Peter Strachan, TransLink claims the State’s per passenger subsidy will rise to $2.38 in 2010-11, up from $2.12 in 2009-10. This subsidy matches each $1 paid by the passenger. The subsidy is paid across 16 bus operators contracted to TransLink, the Brisbane City Council being the largest with 1,030 buses on the road, moving 75 million passengers in the past 12 months. That’s still half of the passenger subsidy across all public transport modes – rail, ferry and bus – which combined comes to $5.46. The passenger subsidy has been calculated and recorded in Queensland budget statements for the first time, in part due to "much more accurate accounting of passenger trips" since the introduction of ‘Go Card’ in February 2008, budget papers say. Strachan says TransLink will spend a total of $465 million on bus services in 2010-11, a $50 million increase on last year. This will include $31 million on 220 new and replacement buses for the network. New high-frequency routes will be rolled out, he adds, with more buses on the busiest south-east Queensland routes and more cross-town services in Brisbane linking major employment and shopping hubs. Strachan says the State Budget allows TransLink to expand other modes, such as train and ferry services, to continue to needs of the integrated network, and expand the Go Card ticketing system. Go Card has led to more efficient bus services, saving about 3,300 hours a week in boarding times, he estimates. "The Go Card – used on 60 percent of all trips across the network – is providing TransLink with the flexibility to tailor up-coming public transport growth to areas of greatest need," he says.